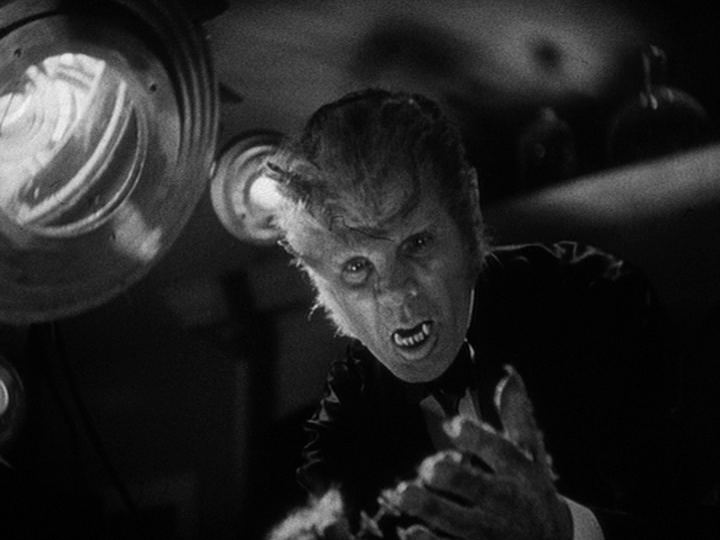 Much like George A. Romero's Night of the Living Dead was the film that turned zombies into flesh-eating ghouls, director Stuart Walker's film Werewolf of London, which was written by John Colton from a story by Robert Harris, is the film credited with changing how we look at werewolves. Apparently this film is the source of the legend that a person can become a werewolf by being bitten by one, and that the change into a werewolf occurs under the full moon. The man who receives the curse in this film is botanist Wilfred Glendon (Henry Hull), who is attacked and bitten by a werewolf while in Tibet searching for the rare mariphasa plant, which grows only in Tibet and blooms by moonlight. 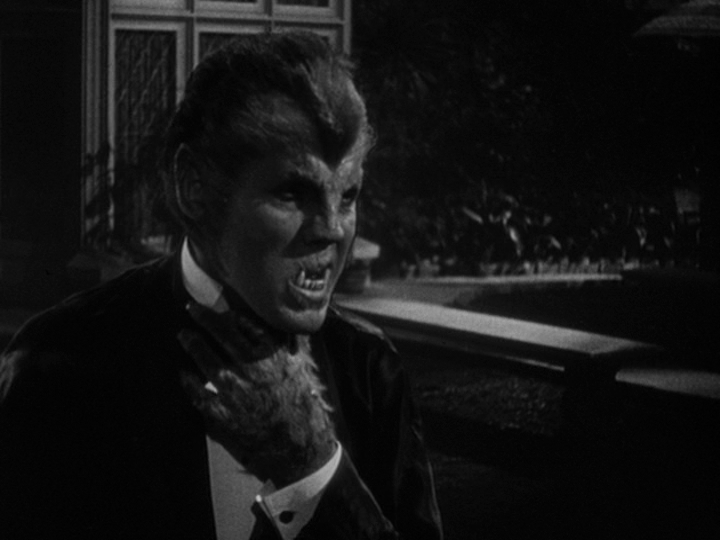 Returning home to London, Wilfred would gladly devote all his time to hanging out his laboratory, watching strange plants eat frogs, and neglecting his wife while she reconnects with a childhood sweetheart, but then the problem of lycanthropy rears its ugly head. On the nights of the full moon, or when he soaks in too much light from the moon lamp he shines on his mariphasa plants, Wilfred finds himself turning into a werewolf. 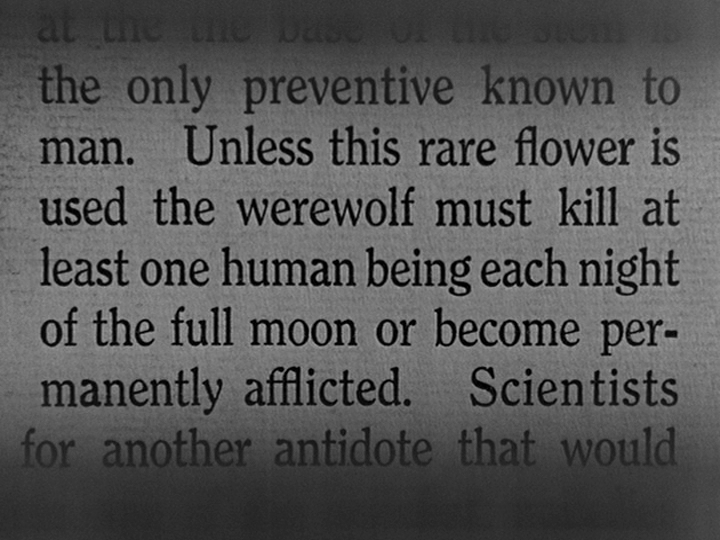 Luckily, the mariphasa plant can be used to stop the transformation before Wilfred goes werewolf. Unfortunately, a fellow botanist steals his blossoms, leaving him with no choice to wolf out, stalk the streets, and kill. 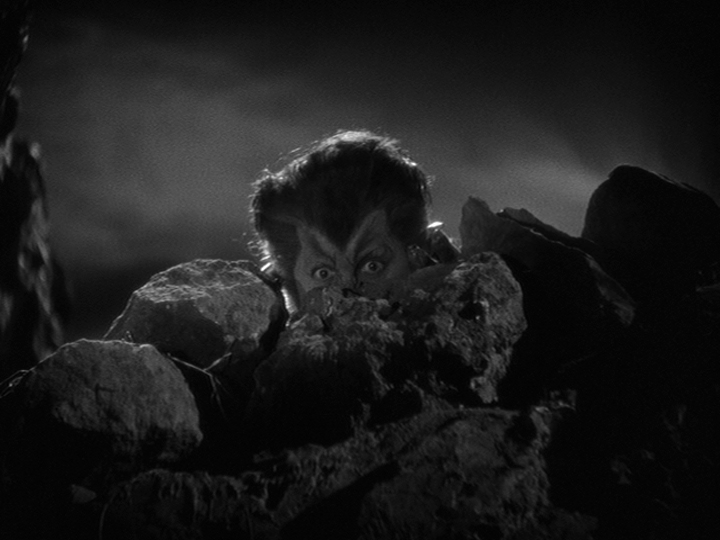 The look of the werewolf is the "furry person" wolf man style, and it's worth noting that the makeup was designed by Jack Pierce, who would give Lon Chaney Jr. a much more popular wolf man look six years later. Pierce originally intended to give Hull the same look Chaney sports in 1941's The Wolf Man, but was told not to obscure Hull's features that much. 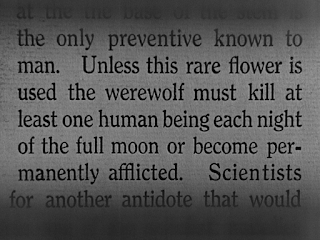 That other botanist took the blossoms because he's a werewolf himself - in fact, he's the werewolf who bit Wilfred. Don't get too excited at the thought that this movie might feature a werewolf vs. werewolf battle, though. It doesn't deliver such a fight. As the film nears its climax, the Wilfred-wolf sets out to do the thing that all werewolves are said to do instinctively: kill the thing they love best. Surprisingly, doing this doesn't consist of Wilfred wrecking his laboratory equipment. Rather, he tries to kill his wife. 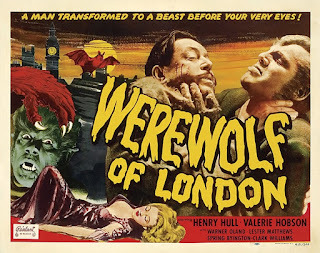 Running a brisk 75 minutes, Werewolf of London is a pleasantly quaint creature feature that made up its own rules about the title monster and somehow managed to forever alter the world's view of werewolves. Just watching it on its own, you might not think too much of it, it doesn't seem so special, but it had a very impressive impact on the world. Most people walked away from this film with new rules for werewolves in their minds; for me, the most memorable part of this movie has always been the scene in which a man meets with his mistress and she says "You don't love your wife and your kids, you love me." This being a horror movie, she is quickly punished for encouraging a man to abandon his family. I recall watching a fair amount of the USA Network when I was a kid and a whole lot of movies broadcast on cable, so chances are that I did cross paths with Commander USA's Groovie Movies at some points during its 200+ episode run that lasted from 1985 to 1989, but I have no childhood memories of seeing Commander USA on TV. 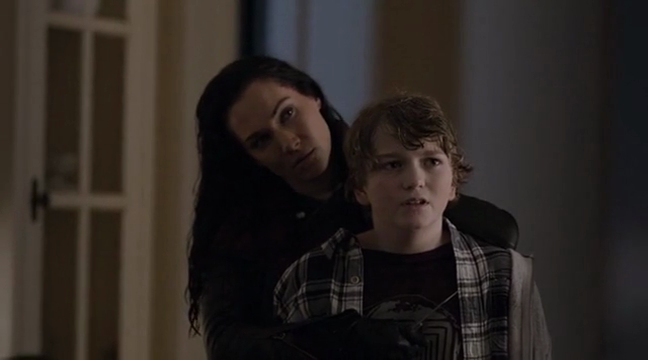 The first time I remember seeing him in action is when I watched The Vampire's Coffin a couple years ago. Commander USA is a cigar-puffing retired superhero who used to fight crime as part of the Legion of Decency and now presents films to the viewing audience from his cluttered video vault, watching them himself on his "telepsychotronic screen". The episode where he hosts The Monsters Demolisher aired right before St. Patrick's Day in 1986 and the film was paired with The Children. 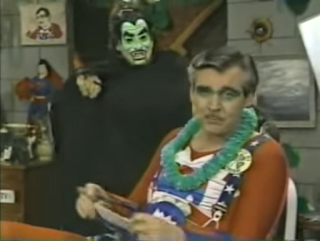 His hosting segments during The Children didn't really amount to all that much, starting off with Commander USA celebrating the holiday by wearing a green mask and cracking jokes about the snakes that were driven out of Ireland - he suspects they work as used car salesmen now. After getting ripped off by a leprechaun peddling fake gold items, Commander USA gets the movie rolling, then shows up occasionally to say something like "We'll get back to The Children right after this." There are a few skits in there - the Commander mourns Flippo the Armadillo, reads a letter from a fan, and interacts with the recurring character Lefty, which was just a face drawn on his right hand with cigar ash - but he got more to do during The Monsters Demolisher, since the movie was shorter. As rap gained popularity in the 1980s, everyone tried to get in on it, including Freddy Krueger. Even Commander USA had his own rap, as he demonstrates right before The Monsters Demolisher begins with a performance of his song "Commander Wrap", which has lyrics like "I'm very cool and real funky, I'm your favorite weird film junkie." The Monsters Demolisher is a 1962 Mexican horror film that is also known as Nostradamus y el destructor de monstruos. It's a film that I had never seen before, but I heard that it originated as a serial that was cut up into four feature films, this one being the second of the four. Germán Robles stars as a vampire named Nostradamus, the son of the French seer, who is on a killing spree that an elderly professor is trying to stop. 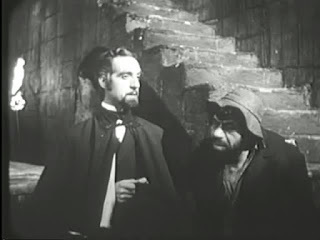 Nostradamus taunts the professor, telling him who his next victims will be, then the professor does his best to keep those people protected while Nostradamus waits to strike. It's a game they play, and the professor isn't very good at it. It was awkward watching The Monsters Demolisher without having seen its predecessor The Curse of Nostradamus first, as it drops the viewer right into the middle of the story, but it was easy to catch up on what was happening. And since these were serial episodes edited together instead of a structured feature film it allowed things to move along quickly, with the story constantly shifting gears. Commander USA actually did his introduction for the film at the same time as The Children intro. He kept it short and simple, saying it stars "your favorite and mine" Germán Robles and giving a quick mention to Nostradamus's hunchback sidekick Leo. The Nostradamus films were apparently shown on Commander USA quite frequently, and some Nostradamus fatigue shows through here, as the segments with the Commander barely reference the film at all. They're mostly focused on St. Patrick's Day, so the Commander is making clover donuts and dyeing his food green. There are only a couple direct nods to The Monsters Demolisher, including a moment where the Commander is nearly attacked by a vampire. Even if he's not mentioning the movie he's showing, though, he's still a likeable presence whenever he shows up on screen. With a title like that, you don't have to wonder what sort of movie this is, do you? Thankfully, this home invasion movie happens to be quite an entertaining and well made film. The set-up: There is something very valuable in the mansion home Chloe (Natasha Henstridge) shares with her wealthy, absent husband and moody stepson Jacob (Liam Dickinson) - something so valuable that a team of thieves led by Scott Adkins, who typically stars in action movies like The Expendables 2 and The Bourne Ultimatum, go to great lengths to locate and retrieve it. They make their presence at the home known by gunning down Chloe's friend and blasting the front door open with explosive charges. Soon they have jammed WiFi signals and cut the phone line, but not before Chloe has made contact with a security system employee named Mike and played by Jason Patric. The police are alerted to the situation, but the house is on a peninsula and the thieves have taken control of the drawbridge they'll have to drive over to respond, and this police force doesn't seem to have access to boats or helicopters. Playing the Sheriff is Canada-based character actor Garry Chalk, who also played the town Sheriff in Freddy vs. Jason. These are just two of his 350 plus credits. With the cops helplessly stuck on the other side of the bridge, Chloe and Jacob left to fend for themselves. As she desperately tries to get them out of this alive, Chloe also takes every measure possible to keep in contact with Mike, who is watching everything that's happening in the house through hidden security cameras. The home invasion of the title happens early on in the running time, allowing for more than an hour of tension and action as Chloe and Jacob do their best to avoid the people searching their house but, of course, are ultimately forced to fight for their lives. The script by stunningly prolific screenwriter Peter Sullivan (he has provided the script or story for around sixty films in the last thirteen years) may have you asking some questions, but it was brought to the screen by director David Tennant (not the Doctor Who guy) in a way that was intriguing, involving, and captivating. I'm a sucker for this type of movie to begin with, and this is a fine entry in the home invasion thriller sub-genre that is carried by strong performances from its lead actors. Steven Seagal doesn't typically do sequels, but in the early '90s he and Warner Bros. wanted something from each other: the studio wanted him to make a sequel to his "Die Hard on a battleship" movie Under Siege and he wanted to direct (and deliver an environmental message with) On Deadly Ground. A deal was made that one of those things would happen if the other did. The Seagal-helmed On Deadly Ground was released into theatres in 1994, and the following year we got Under Siege 2: Dark Territory. 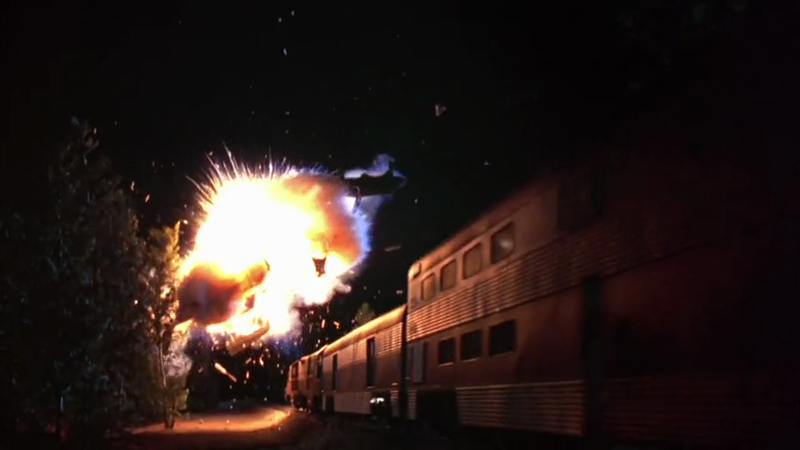 "Die Hard on a train". The Die Hard comparison on this one goes even further than the fact that it's an action movie in which its hero battles terrorists while stuck in one location / on a mode of transportation. Just like every Die Hard sequel except A Good Day to Die Hard started off as an original idea with no connection to the Die Hard franchise and was then reconfigured to be another John McClane adventure, Under Siege 2 started off as an original action script written by Richard Hatem and Matt Reeves (yes, the same Matt Reeves who has gone on to direct such films as Cloverfield, Let Me In, and the sequels to Rise of the Planet of the Apes). When it was chosen to be the basis of the sequel, it was rewritten into a Casey Ryback adventure by Brian Helgeland, who had contributed to A Nightmare on Elm Street 4: The Dream Master several years earlier and would win an Academy Award for L.A. Confidential a few years later. When Dark Territory catches up with Ryback, he has retired from the Navy and used his fame after the battleship incident to start up a successful restaurant in Denver, Colorado. Unfortunately, the brother that Ryback hadn't spoken with in a while and Ryback's sister-in-law were both killed in a recent plane crash, leaving his teenage niece Sarah an orphan. Ryback and his niece, who he had taught some self-defense moves years before, board a train to visit his brother's grave in California. It's on this train that the action will take place. 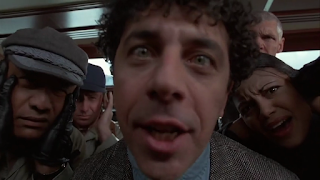 Ryback is just starting to reconnect with his niece when the train is hijacked by former government employee Travis Dane (Eric Bogosian) and a team of mercenaries. Dane has taken control over a particle beam-blasting spy satellite called Grazer One, which he created for the U.S. government. As long as he is in motion, the government won't be able to track the signal controlling the satellite, and the train has just entered "dark territory" - a six hour stretch of track where the train won't be slowed down or stopped, and where it's impossible with the engineer to communicate with the outside world. The train can only keep chugging forward. A terrorist organization is going to pay Dane $1 billion to use Grazer One to destroy a nuclear reactor below the Pentagon, taking out the Eastern seaboard with it. To demonstrate the satellite's abilities, Dane uses it to destroy a weapons factory in China, killing thousands of people in a one hundred mile radius. He proceeds to use the satellite to cause more death and destruction around the world during the countdown to when he's going to use it on the Pentagon. 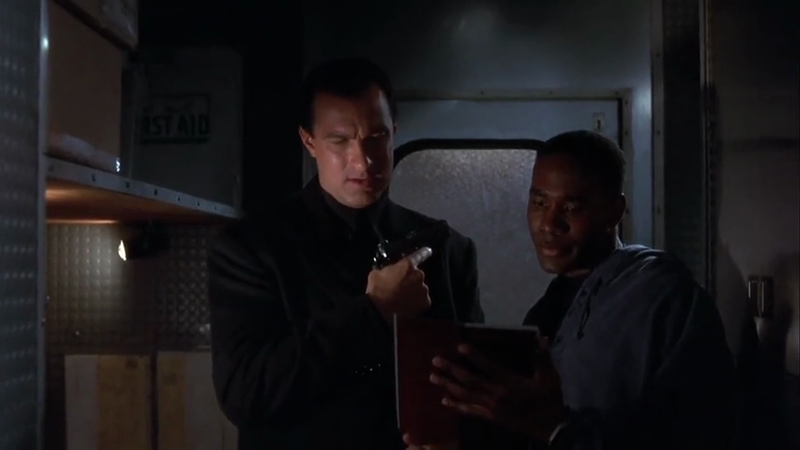 While Dane is doing all this by tapping furiously on his keyboard, Ryback is sneaking around on the train, knocking off mercenaries with the help of porter Bobby Zachs (Morris Chestnut). Bobby is a funny guy and I would call him the comedy relief, but this movie doesn't need comedy relief. It's actually goofy as hell. Bogosian is clearly having the time of his life playing Dane, making the character an over-the-top madman, and director Geoff Murphy (who also directed sequels to Young Guns and Fortress) helps him cross the line into absurdity with the way he shoots certain things, sometimes letting Bogosian scream directly into the camera. Helping the film attain its silly tone is the fact that the satellite effects are atrocious. The way some of the satellite destruction is presented and the dated CG make this movie look much cheaper than it actually was. The things around it are ridiculous, but there are some fun action sequences in here, with some bloody shootouts, fire stunts, explosions, a chase scene, and physical altercations. Under Siege 2 gives you the sight of Seagal fighting Everett McGill (sporting a horrible dye job), which is pretty cool. The familiar faces of Peter Greene, Jonathan Banks, and Patrick Kilpatrick can be seen among the mercenaries, and Kurtwood Smith, Brenda Bakke, and Dale Dye are also on hand. Like the first movie, I saw Under Siege 2 in the theatre, and I was all about it when came out. Rewatching it more than twenty years down the line, I find that it hasn't aged very well. Compared to its predecessor, this is a slight feeling that this series is already jumping the shark - I've wanted to see an Under Siege 3 ever since 1995, but now I'm thinking maybe this franchise wrapped up just in time. If a third movie continued down the path Dark Territory takes, it might not have turned out so well. 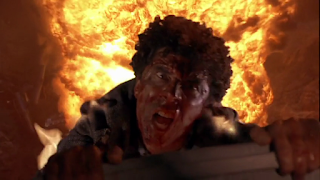 I liked Under Siege 2 more in '95 than I do today, but something about the ending has bothered me ever since my first viewing. To make the climactic destruction and explosions happen, there are probably innocent victims who lose their lives and the movie doesn't even acknowledge them at all. There is a head-on collision with two trains and Murphy just wants you to be focused on the smashes and bangs, on the villain deaths and the sight of Ryback trying to outrun the crash. But that other train has an engineer and a conductor who are likely killed in this crash. All Murphy had to do was include a shot of these people jumping off the train before the collision. As it is, I feel bad for those characters we don't see, and that has always been a strike against Under Siege 2 for me.